Jacaranda is a familiar name in Islamabad. It is familiar because Jacaranda is an unusual boutique guest house that is known for its unique beauty with lush green gardens, hand knotted Afghan carpets and original contemporary paintings. It is known for its luxury comfort and quality hygiene. As the proverb goes that small is beautiful, we provide you with serene privacy which one cannot find in the stereotyped run of the mill hotels. Our charges are very economical. Indeed we are conscious of the budgetary constraints of the corporate world. Where large hotels indirectly charge their guests for services most of whom neither need nor have the time to avail them, we, on our part have tailored for you the services which you would precisely need. Located across the city’s fashionable shopping area, popularly known as Jinnah Super Market, Jacaranda is minutes away from the Federal Secretariat, Parliament, Embassies, and UN offices. Taxi cabs are available right outside the gate. To name a few, our clientele includes the US, British, German, Italian, Austrian, Swiss, Spanish, Turkish and Egyptian embassies, as well as the Canadian, British, and Australian High Commissions, various UN Organizations, the British Council, Asia Foundation, Save the Children, Getz Pharmacy, and US AID. Among business companies, some of our customers are Shell Pakistan, PSO, Procter & Gamble, Reckitt & Colman, World Bank and Asian Development Bank. Our Aim is to provide our guests a home away from home with the highest standard of services. Location: JACARANDA GUEST HOUSE located in 17 College Road. The complete contact information will be provided upon booking confirmation. Above rates are per room per night on BED & BREAKFAST & Airport Transfer BASIS(if applicable). Extra mattress(1 per room) are available on request(optional). 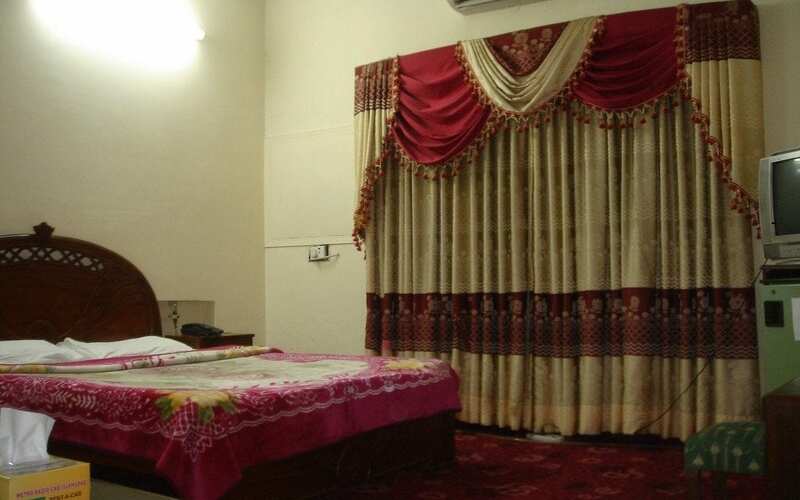 Cancellation, No Show, Child Policy,Extra bed, Meal Rates, Check in & Check out time and other benefits as well as Terms & Conditions of Bookings will be advise by our Reservation Agents upon final booking for each hotel. Advertised Rates are applicable to all markets . We accept payments through Cross Check, Online Bank Deposit, Wire Transfer, demand draft, Western Union and Money gram. Some of the hotels provide free airport shuttle service, however if you prefer to have a PRIVATE CAR TRANSFERS it can be managed at hotel (optional). Jacaranda offers fully air-conditioned / heated guest rooms and suites with full power backup facilities. All of our guest rooms and suites contain one king bed or two twin beds with sleek, modern decor along with a sitting area and a full bathroom with tub or shower. You will pay after booking is confirmed by PakTrip.com and payment instructions will be sent to you at confirmation. You can pay in American Dollars or Pak Rupee by using the following methods. Payments methods include Cross Cheque, Wire Transfer, Western Union, Money Gram, Demand Draft, Online Bank Transfer, Residents of Karachi, Lahore, Islamabad and Rawalpindi can also pay via cross cheque to be picked from their doorstep. You can also use the currency converter which is shown in the right side of the website, by using this you can easily convert any type of currency in each other. You will pay after booking is confirmed by PakTrip.com and payment instructions will be sent to you at confirmation. You can pay in American Dollars by using the following methods. Payments methods include Wire Transfer, Cross Cheque, Western Union, Money Gram, Demand Draft, Online Bank Transfer, USA and UK Residents can pay via Credit or Debit Card for Payment through Western Union Online Pay. You can also use the currency converter which is shown in the right side of the website, by using this you can easily convert any type of currency in each other. Please be sure to select the desired check-in date, put number of nights, number of rooms and other information.